This is one of my favorite Homemade Rolls or Bread recipes. It is a little sweeter than a lot of rolls – almost reminds me of the King’s Hawaiian rolls you buy in the store. 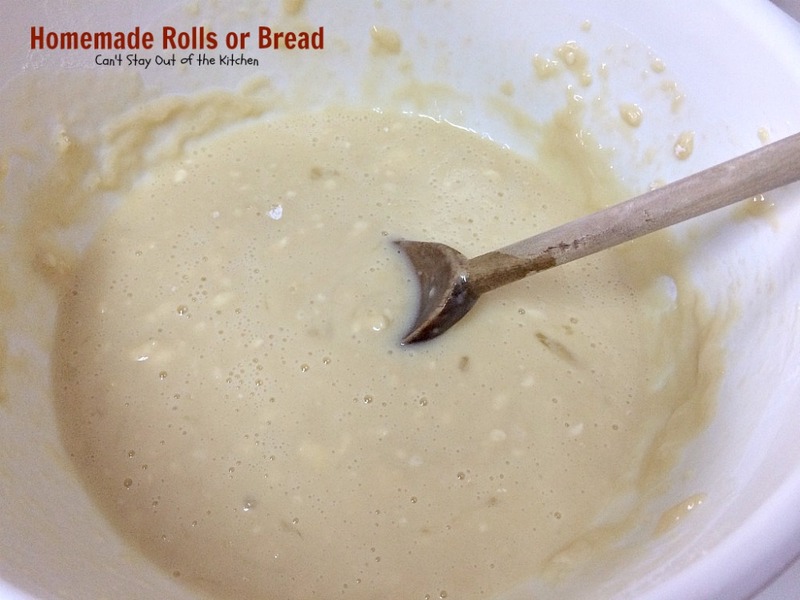 It is not overly difficult for a homemade bread/roll recipe and the taste is really superior to a lot of recipes. We really love it. I made it last night and we had some whopper size rolls! I got this recipe from Sandy Callaway back when we attended First Baptist Church of Indian Rocks in Largo, Florida. Sandy and Warren were part of a young couple’s Sunday school class we were involved in and we got to know them well. We shared a lot of meals over at their home, as they partook at our home as well. Ladies from that Sunday school class were all having babies at the same time and there was quite a contingent of us that were stay-at-home moms. We decided we would get together once a month just for fellowship and a chance to get out of the house and enjoy a lunch meal together. We would bring our kids so they could all play together and entertain each other, and we rotated houses every month. Whoever was the host house coordinated what the main dish was and everyone else brought sides and desserts. Sandy brought this fabulous recipe several times. It was so good I used to beg her to bring it frequently to all kinds of potlucks until finally she said, you need to make this yourself! You can do this, Teresa! It’s really not that difficult. She made sure I had the recipe. Sandy was amazing. She was an algebra teacher in the local high school or middle school and she could remember recipes off the top of her head. She was the one who inspired me to put my brain to work and start remembering what’s in each recipe. That has served me in good stead over the years. This is a Homemade Rolls or Bread recipe you will want to add to your collection. It’s that good! I hope you enjoy it as much as our family and company have over the years. It comes out so tasty every time I make it, and it’s a little quicker than my regular bread recipe. 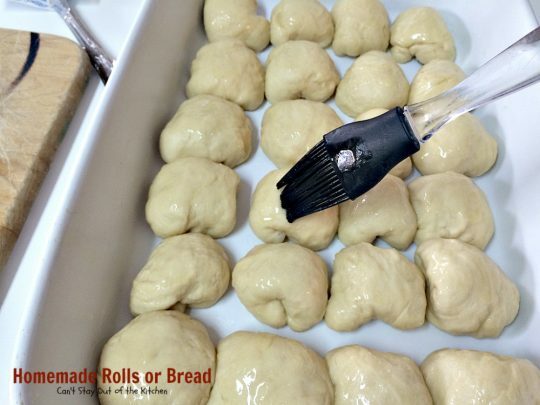 If you prefer, you can shape the dough into a bread loaf instead of individual rolls–but we prefer rolls! When I first posted this recipe in September 2012 it was part of a meal I had prepared for dinner guests. Unfortunately, it was back in the early days of my blog and I was using an iPhone for a camera so the pictures weren’t as lovely as I would have liked. As a result, I’ve been systematically going back through all my first year blog recipes and remaking them in order to shoot better, more appealing pictures. To that end, I recently remade this recipe (December 2015) to serve along with a couple of different soups: Homemade Turkey and Dumplings, Canadian Cheese Soup, and also with Chicken A La King. The rolls were so delectable. 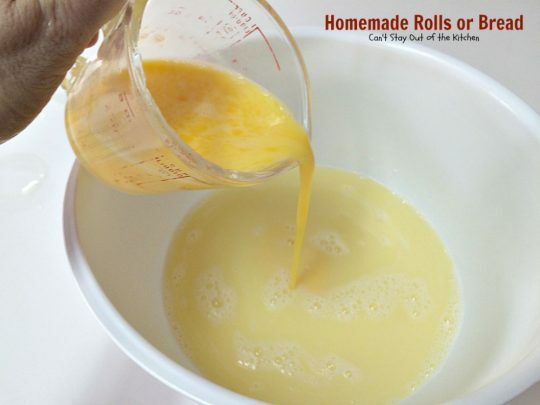 Because this recipe makes 3 dozen rolls, you can certainly plan to serve it with several different entrees like I did. While these rolls are great to serve with soup, we really enjoyed them with the Chicken A La King dolloped over top. I hope you give them a try soon. You’ll find your family asks you to make them again and again, just like mine has over the years! Homemade Rolls or Bread is an awesome recipe. Everyone raves over these rolls whenever I serve them. 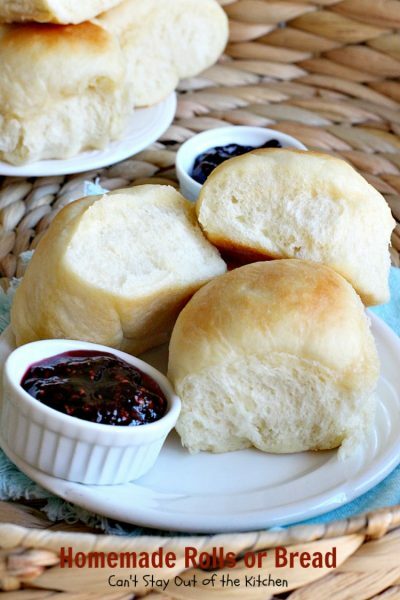 While we enjoy rolls served with apple butter or jelly, they’re great served with Chicken A La King ladled over top! 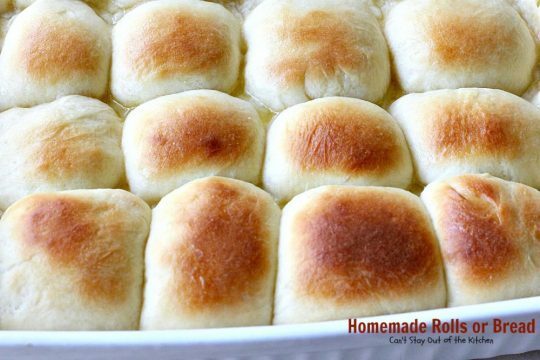 This recipes makes 3 dozen homemade rolls–enough to serve with several main dish entrees or to freeze for later. 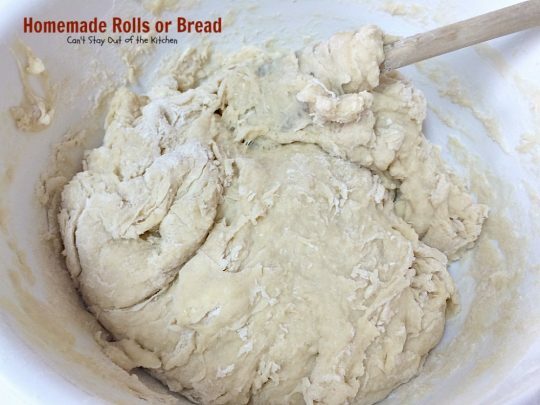 Make up a batch of Homemade Rolls or Bread for the holidays. 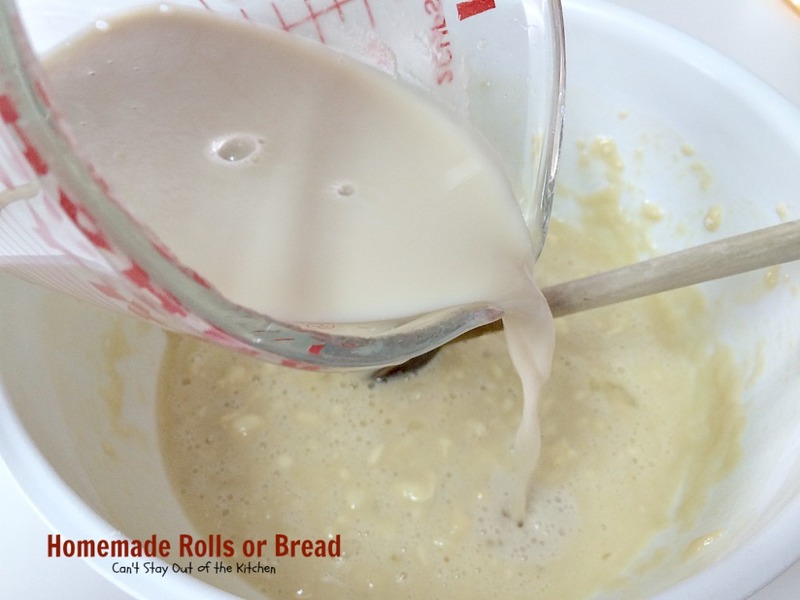 While I usually make this recipe into rolls you can also bake it in bread pans. 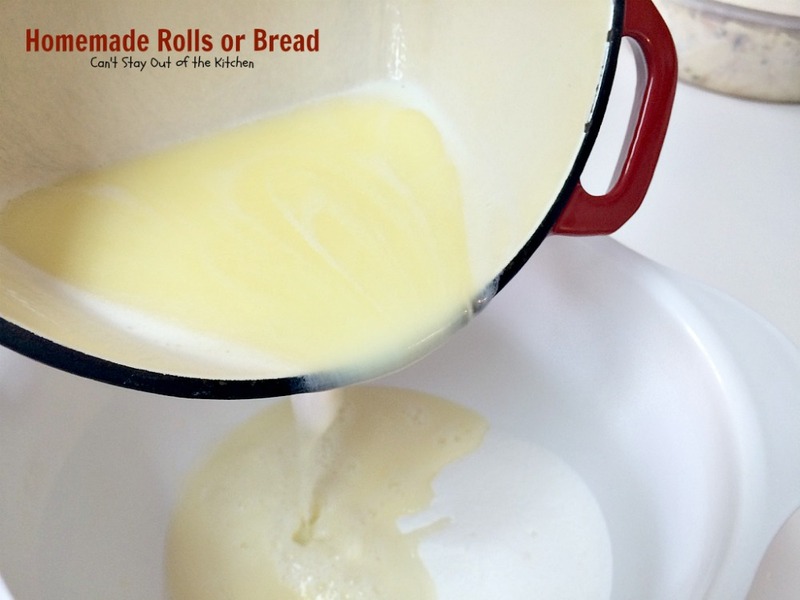 Melt butter in saucepan with milk. Place sugar in large mixing bowl. Add melted butter and milk to sugar in bowl and stir to combine. 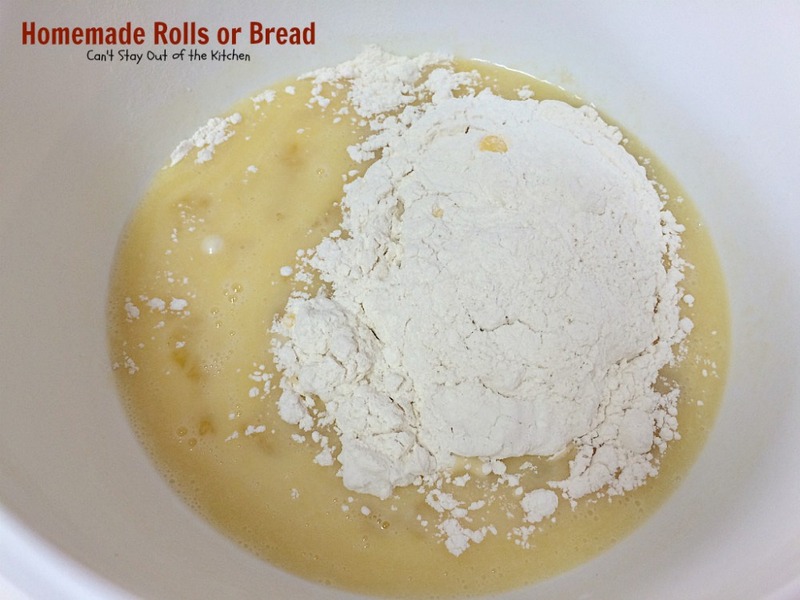 Stir in 1 cup of bread flour. (Don’t use all purpose flour. It doesn’t have enough vital wheat gluten because it has been milled out of the flour). Stir flour into other ingredients. Dissolve 2 packets of rapid rise yeast into hot water. The temperature should be about like bath water – but not scalding. Lukewarm is not hot enough to activate the yeast, scalding will kill the yeast. Sprinkle yeast over top of hot water in measuring cup. Stir to dissolve completely. Add yeast mixture to mixture in bowl. Stir in one cup of flour at a time and combine well each time. Sprinkle flour on surface. Place dough on top of flour and sprinkle heavily with more flour. Work some of the flour into the middle of the dough by pushing it into the dough with your fingers. 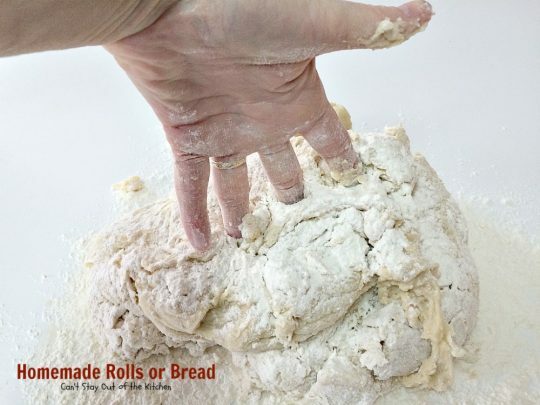 I usually keep poking with my fingers into the dough multiple times for about 15-30 seconds trying to get as much flour into the center of the dough as possible. 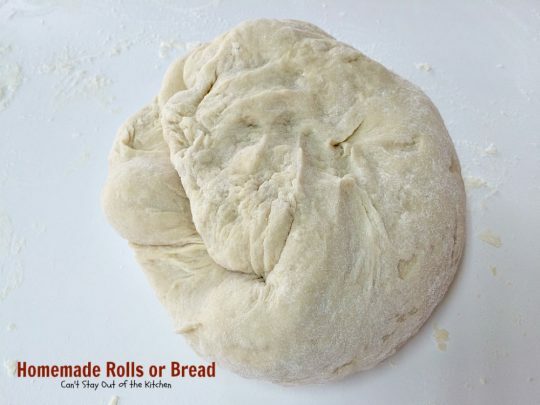 Knead and roll the dough. Pull toward you with one hand, then push away with the heel of your other hand. Here I am pushing the dough back after working more flour into it. Pull and push in a smooth almost rocking-type motion. Pull the bread toward you with one hand, sweeping flour up into the bottom of the dough at the same time with the other hand. This helps work the flour into the dough. If you don’t do this you will have a sticky mess. When the dough is no longer sticky you should be close to finished kneading. It took between 8-10 minutes to knead the dough (and I usually do close to 50 kneads [pushes with the heel of my hand] each minute). Here’s the finished dough. Now place the dough on a floured bread board. You can either lay the board over a large mixing bowl filled with hot water and place in your (cold) oven to rise (which I did), or you can heat the oven for exactly one minute and then turn it off. Cover the dough with a tea towel and let rest 20 minutes. 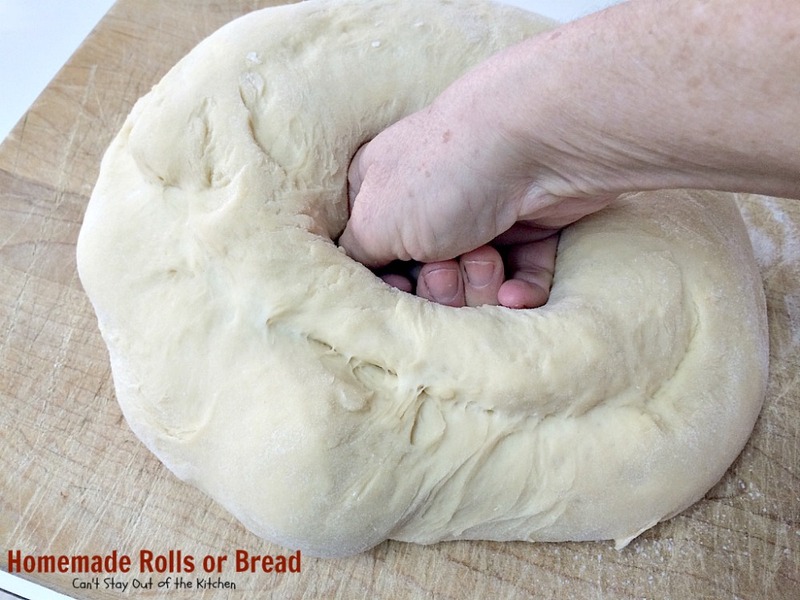 Remove from warm place and push dough down with your fist. Knead the dough again for a couple of minutes. 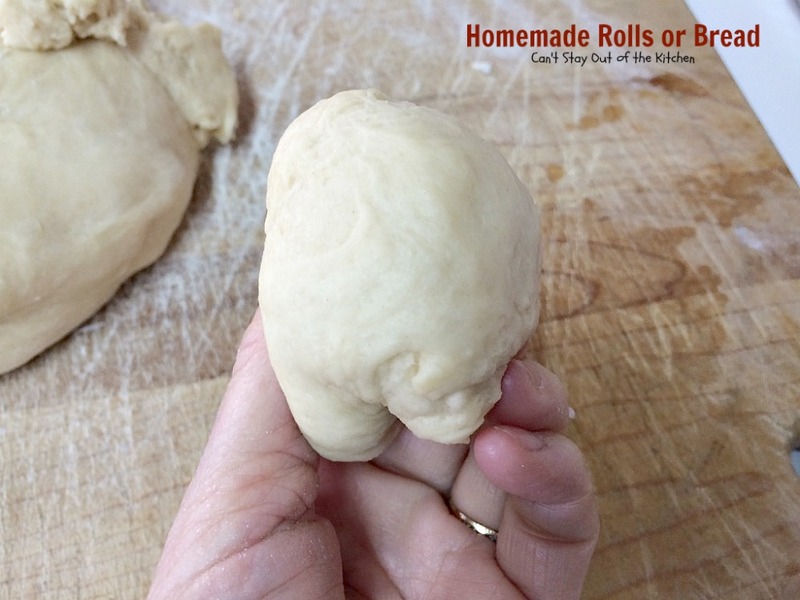 You can stretch and knot the dough and pull it apart that way. I pulled off golf-ball sized pieces of dough. 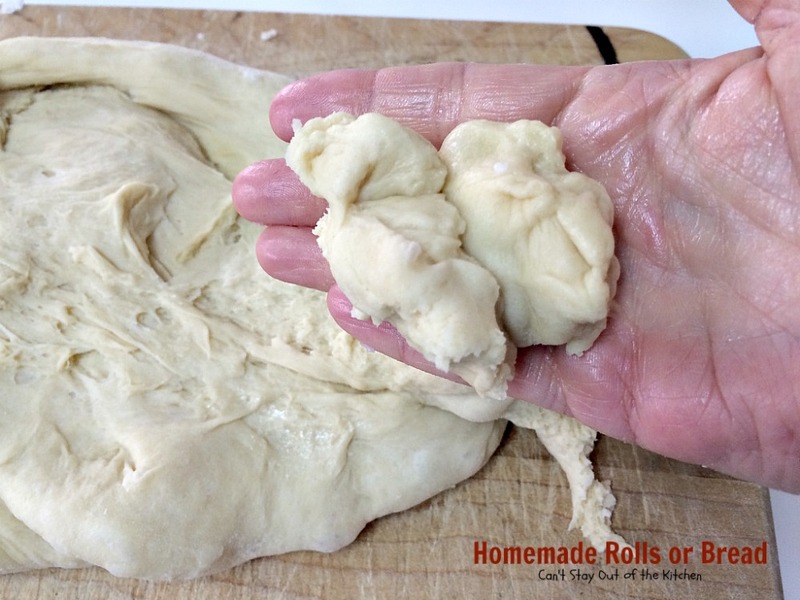 Flatten dough with either your hands or a rolling pin. Try to get the bottom surface very smooth without a lot of indentations so the rolls look nice. Here the dough is flattened in a round. Tuck all sides of the dough underneath and place on sprayed cookie sheet. This recipe makes about 3 dozen rolls. 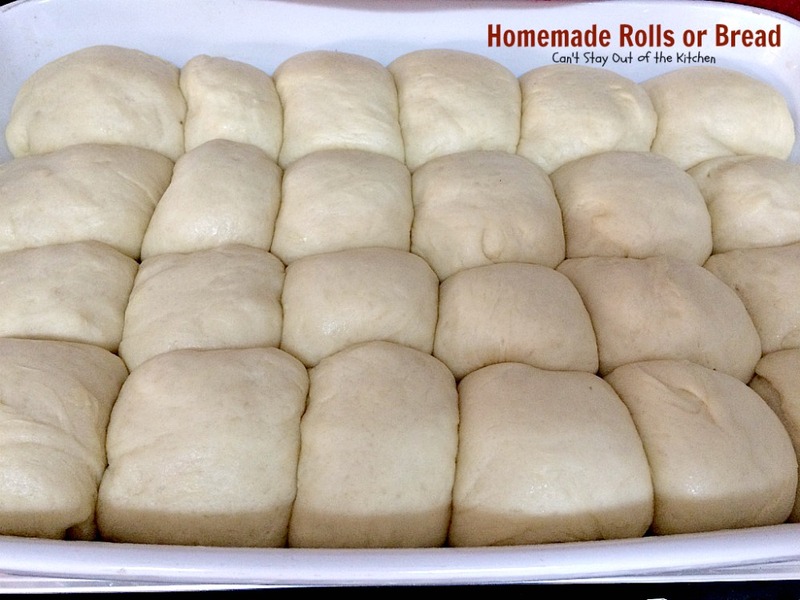 When you have finished rolling them all out, brush the tops and sides of the rolls with melted butter. Cover the cookie sheets with a tea towel and place it in a warm place to raise. This will take about an hour, although I have had it take 45 minutes if my garage is really hot or if I place it in a 100 degree oven that I heated for only 1 to 2 minutes. Once the rolls raise they’re ready to bake. Bake at 350 for 15 to 20 minutes or until done. I currently reside in a rental house and I’m still trying to get used to the oven. I should have rotated the dish of rolls half way through baking time so the rolls browned evenly. I highly recommend that you do that if you have an oven that doesn’t brown evenly. Brush melted butter over the tops of the rolls again. This will prevent the rolls from having hard crusts. It is a crucial step for this recipe. 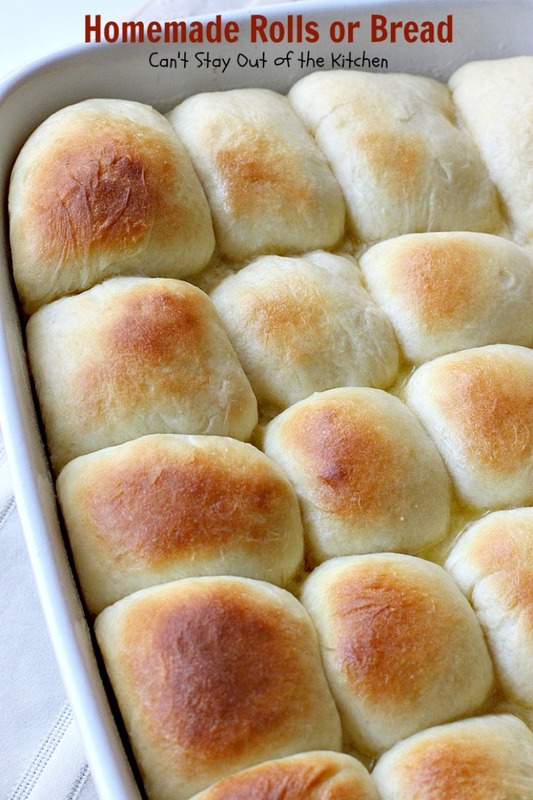 The butter has absorbed into these wonderful rolls and they are ready to serve. Homemade Rolls or Bread are a little on the sweet side and taste like Hawaiian Rolls. 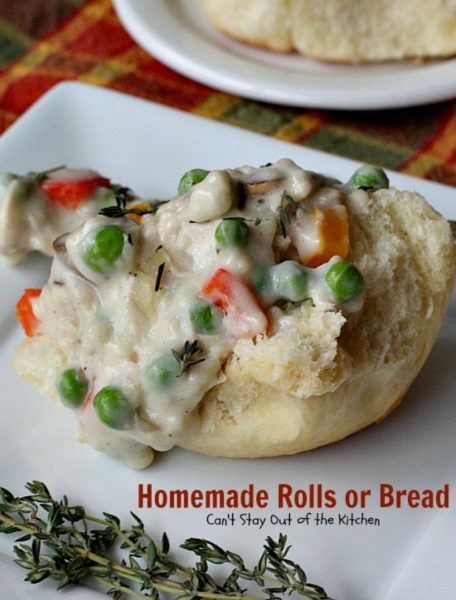 Serve Homemade Rolls or Bread as party of your holiday menu or with any soup or main dish entree. We served Homemade Rolls or Bread with Homemade Turkey and Dumplings. Both were savory and delectable. We love serving Homemade Rolls or Bread with jam and preserves, too. 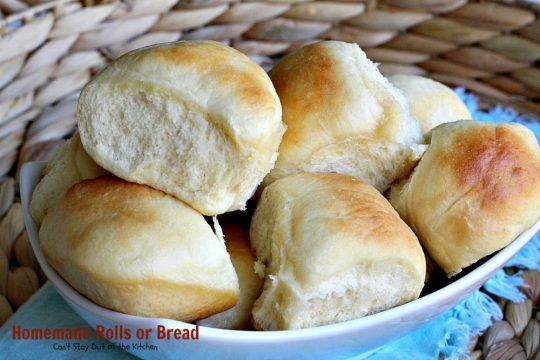 Homemade Rolls or Bread are the most delicious rolls you will ever taste. 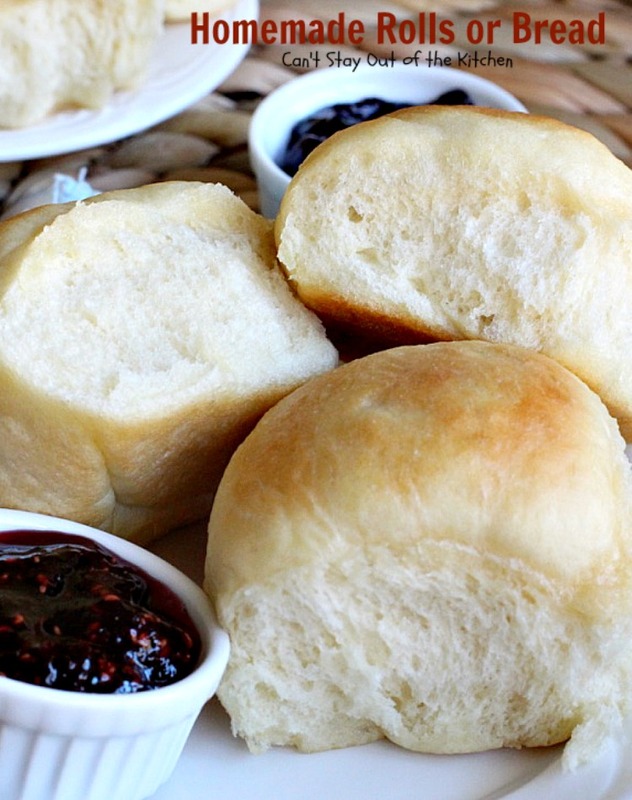 These rolls are on the sweeter side and taste like Hawaiian Rolls. These rolls are superb and great for holiday meals or any time you want to make Homemade Rolls or Bread. Heat milk until butter melts. Add to sugar in large bowl adding beaten eggs. Stir in 1 cup flour. Dissolve yeast in hot water. Continue to add flour one cup at a time. Slide onto floured board and roll and knead. Rest for 20 minutes on floured board under bowl in warm place. Punch and knead again before rolling in long strips and knotting. Place on slightly greased cookie sheet. Cover with towel and let rise 1 hour in warm place. 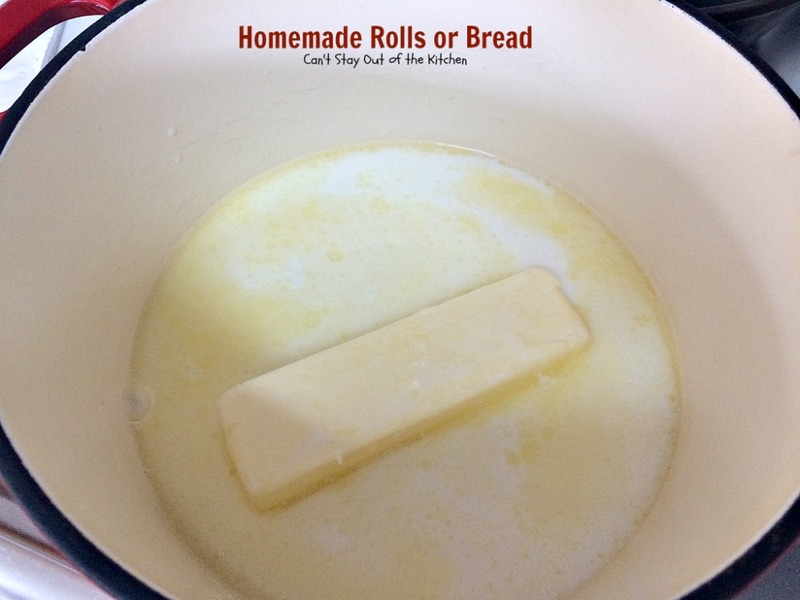 Brush with melted butter, and then bake at 350° for 15-20 minutes or until lightly browned. As soon as rolls come out of oven, brush with melted butter again. NOTE: I just shape these into the typical round roll shapes. NOTE: Preparation time does not include time required to raise rolls twice. NOTE: Lukewarm water will not activate the yeast. The water needs to be about 90-95 degrees. NOTE: If your oven is old or doesn't brown evenly, you may want to rotate the baking sheet half-way through the cooking time so both sides cook more evenly. NOTE: Keep the dough away from drafts from A/C units or open windows or it will kill the yeast so the bread won't raise. 2/3 to ¾ cup warm water (it needs to be hot like bath water but not scalding. About 90-95 degrees). I just shape these into the typical round roll shapes. [br][br]Preparation time does not include time required to raise rolls twice. [br][br]Lukewarm water will not activate the yeast. The water needs to be about 90-95 degrees. [br][br]If your oven is old or doesn’t brown evenly, you may want to rotate the baking sheet half-way through the cooking time so both sides cook more evenly. [br][br]Keep the dough away from drafts from A/C units or open windows or it will kill the yeast so the bread won’t raise. Homemade Rolls or Bread is one of the best recipes for rolls you’ll ever eat. 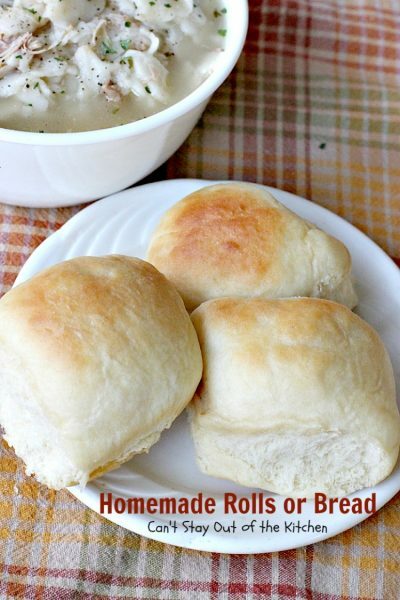 Homemade Rolls or Bread is one of our favorite recipes. 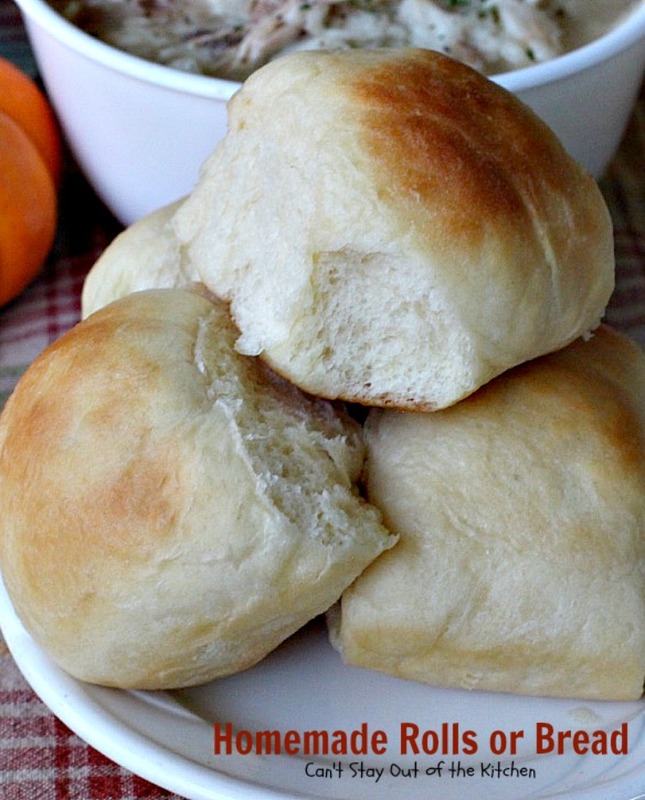 We love serving these rolls for holiday dinners. You may also enjoy these delicious recipes! Your rolls look so delicious!! You put so much dedication, passion and heart in all your recipes! It shows! thanks for such kind words. I like looking at all your stuff too! PERFECT – recipe, wonderful photographs…really, really great – will DEFINITELY try..! Thanks, I hope you enjoy it. There is nothing like home made bread. I have made homemade rolls using the breadmaker for the first half of the process. Do you think this would work for yours? 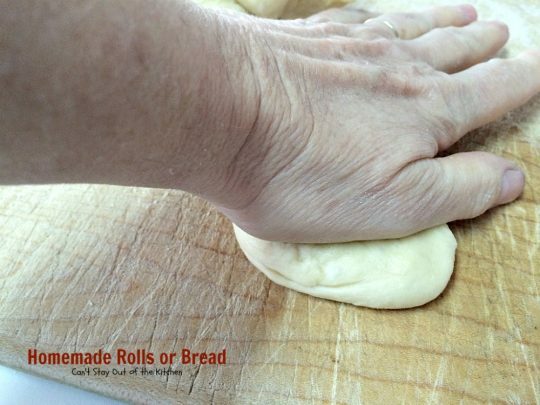 You can, but the process of kneading by hand makes the texture come out so much better. I can’t explain it but kneading from any other method toughens the bread. 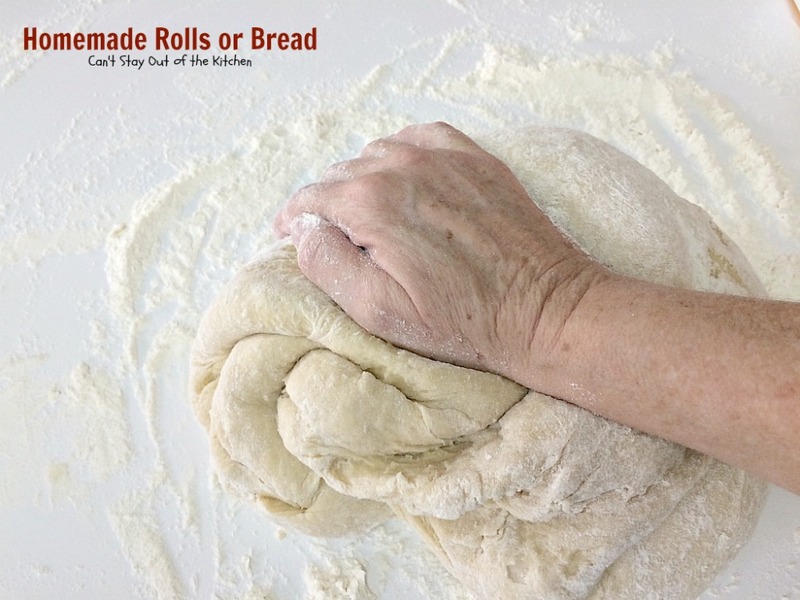 Unless you regularly knead you probably can’t distinguish the difference because it isn’t done much any more. 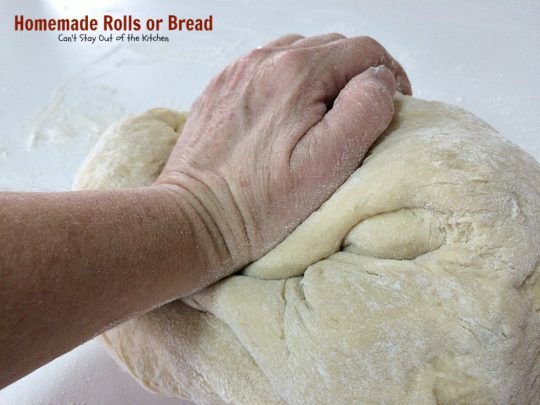 If you are physically able to knead try it one time like this & eat the rolls while they are still warm. It’s just a different texture. This recipe can be kneaded in about 5-8 minutes. If you’ve never kneaded before look at my video on tips for baking homemade bread. 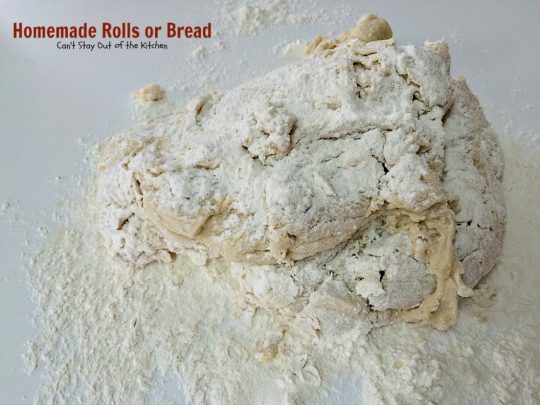 This recipe doesn’t need quite as much extra flour as that bread in the video but you will be able to understand the concepts when you watch it. My daughter in law makes all her rolls in the bread maker also, but I stand by the difference in texture with hand kneading. If you have time try it like this once, you will be hooked! 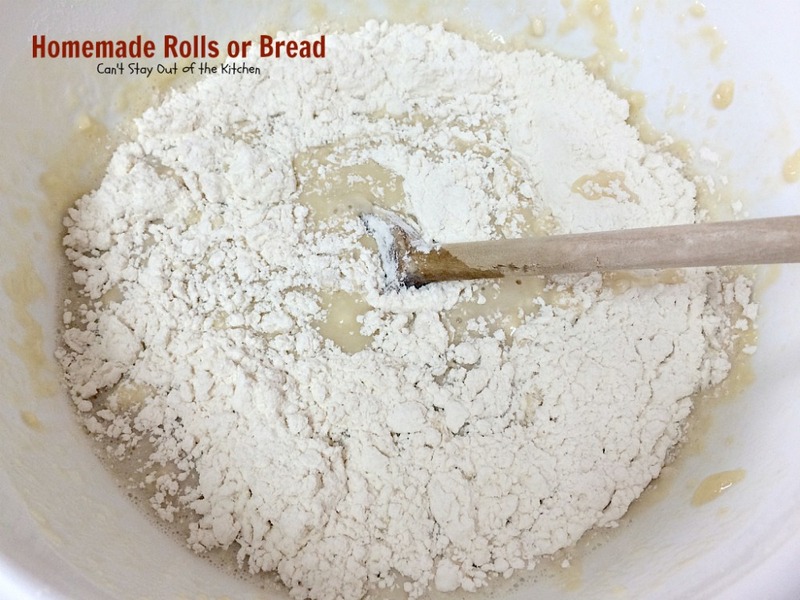 Kneading is really easy & this particular recipe is one of the easiest bread recipes to knead I have ever used. Try it & let me know what you think. (using a heavy whole wheat flour is harder to knead than this light bread flour). Thank you for the info. I will try it without the machine. btw, thanks for following my blog. I hope you enjoy looking through the recipes and let me know what you try and what you thought of it. I’m always looking for ways to improve recipes! Will do. I am currently in Afghanistan so I am not doing any cooking right now. But I will definitely be cooking when I get back home. Thanks. 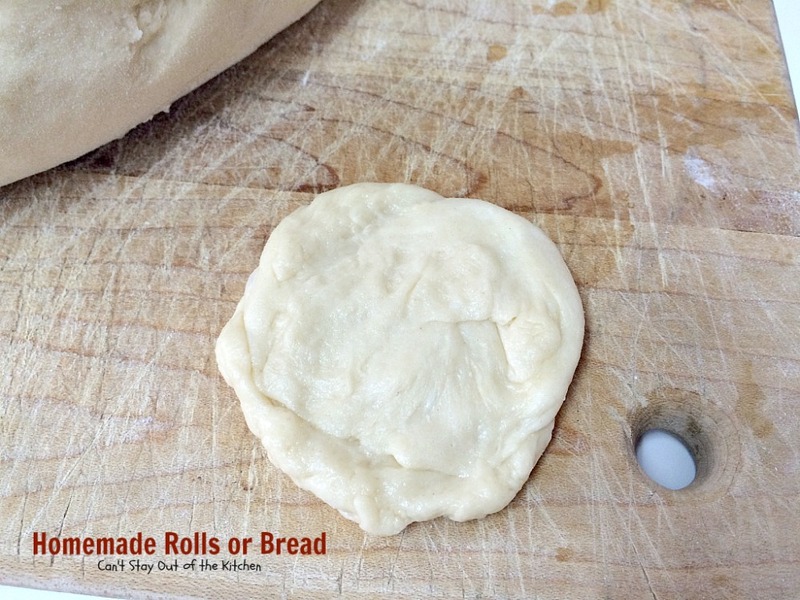 Great instructions that walk you through making bread and roll dough. Please take the time to explore. Thank you so much! Guess what!? I grew up in St. Pete, so I know exactly where you’re talking about! Yeah, we lived in Largo for years! These would be fabulous for thanksgiving. You’ll need to find a warm place for them to rise. If you have a regular stove unit you can place them covered on the top of the stove if you’re not using it the whole time for other things. You may have to turn & rotate the pan so all the rolls can get access to those warm spots coming up thru the pilot lights or other places thru the burners where the heat from the oven vents. Other good places are on too of a warm dryer or if you have a double oven & you can turn it on for 1 minute before shutting it off, the bread can raise in there. Just finding a warm spot will be the most difficult thing especially if it’s already cold where you are. You can make them up earlier in the day & keep them warm, but it really is nice to plan to bake them when the turkey comes out & you have to cut it down. 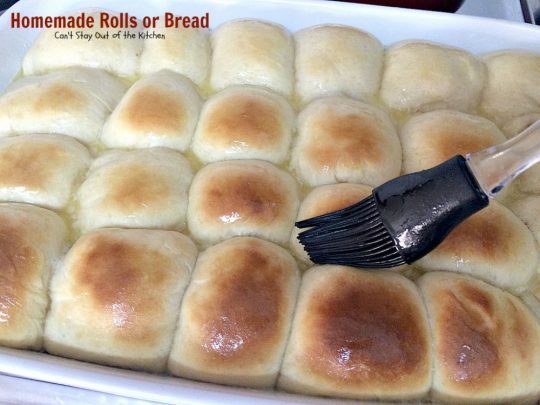 Then you have nice, hot rolls @ the same time as everything else is ready. 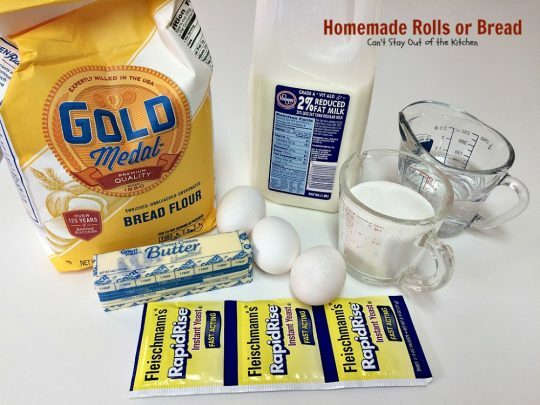 The rolls look wonderful – I also admired the pretty placemat in the background on one picture. Your instructions are so detailed that even a first-time baker should be able to make these. That’s my hope. I started the blog to help a new generation of bakers and cooks who weren’t fortunate enough to have stay-at-home moms who could teach them how to cook. Even though I had a stay-at-home mom, she never taught me how to cook! My husband was the one who did that! Also, a lot of people are visual and they want to see pictures of how everything works, whereas my generation because we did not have all this stuff growing up had to learn to create our own pictures in our mind of what was going on. Anyway the pictures are for those who won’t try recipes unless they see what it looks like and what the end results are supposed to be. Thanks for your kind comments. I appreciate your feedback very much. I just copied your recipe. I would like to reblog this later next week. You have a very pretty kitchen. Thanks. You need to try it out sometime and let me know what you think of it. Reblogged this on Fun and Fitness at Fifty. Sign me up to be emailed about new posts! Copyright © 2019 Can't Stay Out of the Kitchen. Legal Information.